Reverse, 300-thread count cotton sateen. EXCLUSIVELY AT NEIMAN MARCUS Floral sham with solid 2.5" mitered flange. Solid back with zip closure. Cotton/linen/polyester/viscose. Dry clean. 26"Sq. EXCLUSIVELY AT NEIMAN MARCUS Floral sham with solid 2.5" mitered flange. Solid back with zip closure. Cotton/linen/polyester/viscose. Dry clean. 26"Sq. Made in the USA of imported materials. Velvet sham in distressed damask pattern. Fabric 1: cotton/rayon. Fabric 2: polyester. Dry clean. 26"Sq. Made in the USA of imported materials. EXCLUSIVELY AT NEIMAN MARCUS After Glow sham with 2.5" self ruffle. Solid khaki back with zip closure. Linen/rayon. 26"Sq. Dry clean. Made in the USA of imported materials. 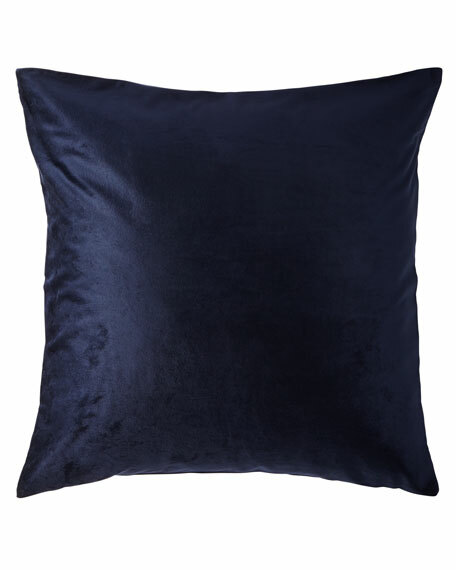 EXCLUSIVELY AT NEIMAN MARCUS Printed sham with 2" top stitched flange. Matching two-piece envelope back. Cotton. Dry clean. Made in the USA of imported materials.